Junior Nation has shown their support for Dale Earnhardt Jr. after his Daytona 500 victory by purchasing merchandise at a record-setting pace. 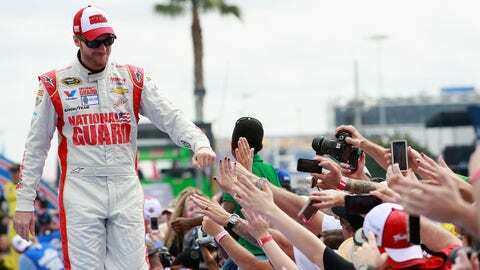 There’s little doubt Dale Earnhardt Jr. is the most popular driver in NASCAR today. His loyal group of fans, affectionately known as ‘Junior Nation,’ have stuck with their driver through the many ups and downs of his career. Now, after Sunday’s dramatic Daytona 500 victory, the fans are coming out in full force to show their support and own a piece of Earnhardt Jr. history. According to Fanatics.com, the largest online retailer of officially licensed sports products, Dale Earnhardt Jr. has seen a 1,000 percent increase in merchandise sales compared to the start of last season. The sales were generated from 45 of the 50 states, with top five states being Florida, California, Virginia, Pennsylvania and New York. Perhaps most suprising of all, the top market for merchandise sales was New York City. One merchandise item in particular seems to be flying off the shelves. According to Lionel Racing, the official die-cast of NASCAR since 2010, Earnhardt Jr.’s Daytona 500 winning car is on track to become the highest selling die-cast in history. In just 12 hours, the ‘race-run’ die-cast – complete with tire scuffs, scratches, confetti and tape on the nose – was more than double any other first full day’s sales of any other win car. The direct-to-consumer channel was selling the cars at a rate of more than 100 per hour. Dale Earnhardt Jr.’s ‘race-run’ Daytona 500 winning die-cast will feature tire scuffs, confetti and even the debris picked up at the end of the race. "When Dale Jr. crossed the finish line at Daytona, we had no doubt this car would be one of the biggest sellers of the year," said Lionel Racing SVP and General Manager Howard Hitchcock. "We are now predicting this car to be the biggest seller in our company’s history." Some fans might even get a little something extra in their die-cast order. Lionel has included Dale Jr.’s win car in the Lionel Golden Ticket promotion, putting more the 700 ‘Golden Tickets’ into the 1:24 scale die-cast. 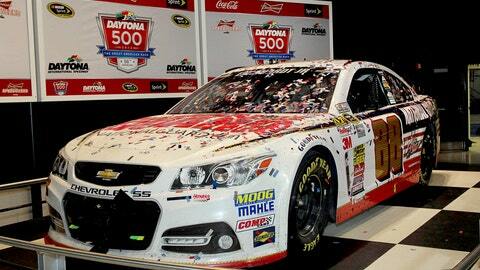 One of the grand prizes for receiving a ‘Golden Ticket’ is a ride-along experience with Earnhardt Jr.